Sword Art Online is a Japanese light novel series, written by Reki Kawahara and illustrated by Abec. Taking place in the near future, the series focus lays upon virtual reality MMORPG worlds. The light novel began publication on ASCII Media Works Dengeki Bunko from April 10, 2009. The series spawned five manga adaptations, an animated tv series and several games for Sonys portable devices. 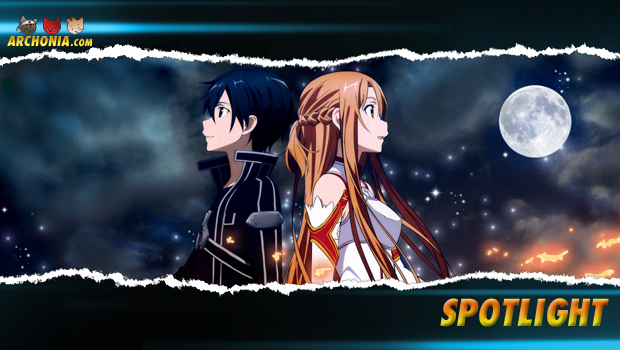 Sword Art Online (SAO) is a Virtual Reality Massively Multiplayer Online Role-Playing Game , released in 2022. With the Nerve Gear, a virtual reality helmet that stimulates the user’s five senses via their brain, players can experience and control their in-game characters with their minds. On November 6, 2022, the players log in for the first time, later to discover that they are unable to log out. They are then informed by Akihiko Kayaba, SAO’s creator, that if they wish to be free, they must reach the 100th floor of the game’s tower and defeat the final boss. However, if their avatars die in-game, their bodies will also die in the real world. One of these players is Kazuto “Kirito” Kirigaya, a skilled player who is determined to beat the game. As the game progresses for two years, Kirito eventually befriends a female player named Asuna with whom he ultimately falls in love. After the duo discover the identity of Kayaba’s avatar Heathcliff in SAO, they confront him, freeing themselves and the other players from the game. Upon being sent back to the real world, Kirito learns that Asuna and 300 other SAO players have still not awakened yet. Following a clue about Asuna’s whereabouts in another VRMMORPG called Alfheim Online (ALO), Kirito also enters the ALO’s mainframe. Helped by his sister Suguha Kirigaya, known as Leafa in the game, he learns that the trapped players in ALO are part of a plan conceived by Nobuyuki Sugō to perform illegal experiments on their minds to put them under his control, including Asuna, whom he intends to marry in the real world in order to take over her family’s company. Soon after, Kirito plays another game called Gun Gale Online (GGO) to investigate the mysterious connection between it and deaths occurring in the real world. Assisted by a female player he meets in the game called Sinon, he identifies and exposes the culprits, who include some former members of a murderous guild he had previously encountered in SAO. Previous Post : Sword Art Online: Asuna Next Post : Rurouni Kenshin: Makoto Shishio revealed!